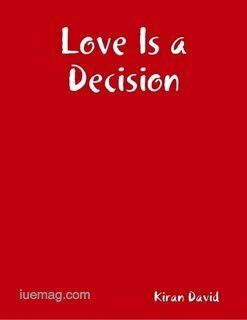 'Love is a Decision' is designed to help people of all ages understand the beauty of love and relationships. Love is demanding. Love is at times difficult. However, love is worth it. Through 'Love is a Decision', David guides his readers through the complexities of understanding the process of deciding if you are ready to love and more importantly, how to love. Throw everything you think you know about love out the window. Now run outside, pick it up and throw it out again. You have been brainwashed, bamboozled and bewitched. You thought fictional dystopias like 1984, Fahrenheit 451, Anthem and The Hunger Games were simply metaphorical ideas? Well, there is good news and bad news. The bad news is that you were wrong; we live in a society where love has been twisted, distorted and contorted into something completely abstract. Relationships, and our pathetic attempts at them are simply just symptoms of a greater issue at hand. We have lost the true understanding of what love is, how it works and why it works. Social media gives us false ideas. Racism, prejudices and bigotry have diluted the purity of love more than we are comfortable admitting. We would rather conform to the standards, beliefs and practices created by entertainment industries and fictional love stories rather than DO love the right way. We in fact live in a postmodern society where love has become an emotional, seemingly uncontrollable aspect of our lives. Where "Happily Ever Afters" are created by spontaneous combustion. Where effort, commitment and conscious decision-making are no longer as important as feelings, public attention and self-fulfillment. Our relationships are a joke. Literally. The disconnection in relationships is often blamed on external factors such as timing, location, environment, etc. However, how often does one observe the internal factors? Are you in a place to love someone? Have you been shown or taught what it really means to love and be loved? We look back on our previous experiences in embarrassment, disdain, and incommodious laughter. We go into new relationships with backup plans, secret agendas and trust issues that if known prior, would make us unsuitable candidates for love. So where do we go from here? What do we do? How do we reprogram ourselves? Is it realistic? Is it possible? Is it worth it? Did you already forget that this was just the bad news? I sure hope not. Because the good news is so important, necessary and conducive to the idea of successful love. A book about decision making. A book for those who want consistency and not just intimacy. A book that will upset the indecisive, offend the selfish, disappoint the impatient and excite the open-minded. And it does not even begin with a uninspiring life story about the author. It does not need a Hollywood gimmick or a Disney fairytale to invoke inspiration. It begins simply with a dynamic four worded statement that when understood and applied, will change the way you love forever. And here it is. Are you ready? Brace yourself... Love is A Decision. Love is a Decision is designed to help people of all ages understand the beauty of love and relationships. Love is demanding. Love is at times difficult. However, love is worth it. Through Love is a Decision, David guides his readers through the complexities of understanding the process of deciding if you are ready to love and more importantly, how to love. iU eMagazine: What inspired you to write this book? 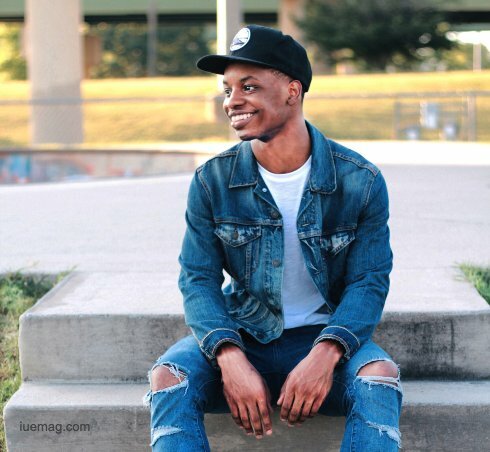 I was inspired by Millennials and young people who have misconstrued ideas about love and relationships. I wanted to help as many people as I could by using personal experience, practicality and emotional intelligence to show that we have more power in our love lives than we think. iU eMagazine: Who is your inspiration when it comes to becoming an author? Oprah Winfrey and Issa Rae. Two young black women who did the best they could with their gifts and simply want to be relatable and helpful to their demographic. I saw the way they stayed consistent (each in their own way) and achieved success. I was inspired by the idea that what I have to say could help the people around me. iU eMagazine: What’s your piece of advice for other aspiring authors? To every aspiring author, consistency is key. How you approach your book, your project, your baby on the small days will ultimately determine your big day success. Stay diligent, stay true to yourself and trust that people will relate. Do not worry about sales or success, simply focus on reaching as many people as you can. Lastly, PROMO PROMO PROMO. All it takes is one person to see your material and your life is changed forever. Good luck!